If you’re going for the award for most hideous shoes you start with a pair of bowling shoes and cover them with something Andy Warhol coughed up and voila! 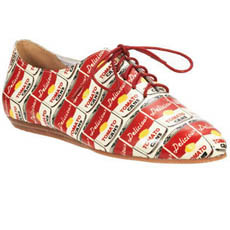 Souped-up Shoes by Jeffrey Campbell are so unoriginal that he couldn’t even put his own name on them for fear of copyright infringement. These shoes would go great with a Marilyn Monroe print t-shirt, a degree in Contemporary Art and an undeserved sense of accomplishment.